Horseid beach, Bunes beach, and Kvalvika beach are the three best beaches of the Lofoten Islands. 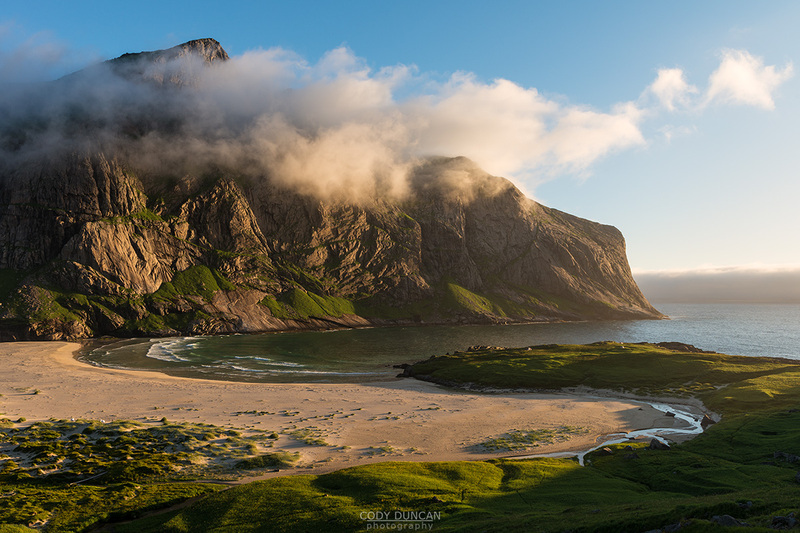 In my previous article, ‘Lofoten Beach Guide,‘ I wrote about the most scenic beaches that are possible to drive to. While all those beaches are indeed quite nice, to get to the best of the best, you’re going to need to put your legs to a bit of work. 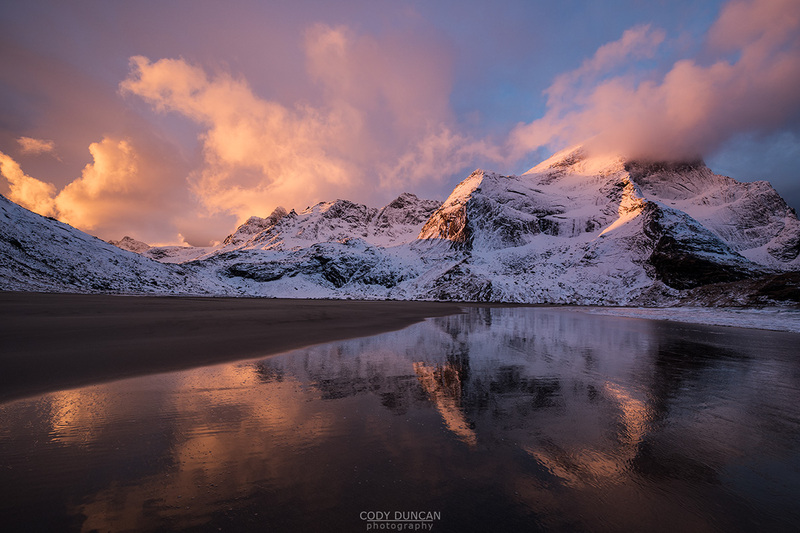 All three beaches are located on the rugged and isolated northern coast of Moskenesøya, the westernmost island of the Lofoten Archipelago. 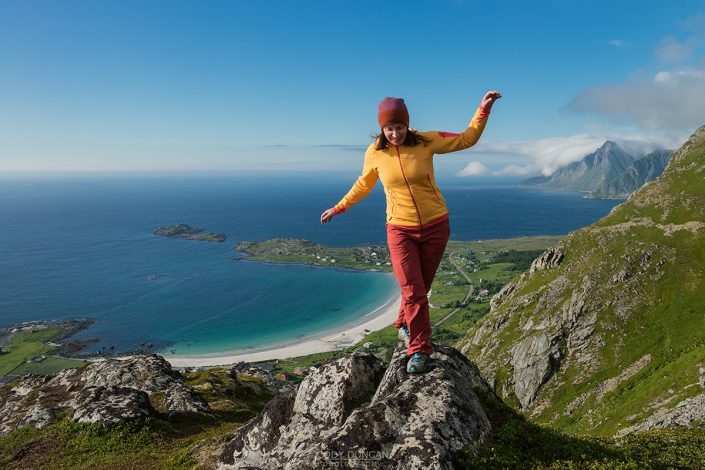 Kvalvika beach, the easiest to reach, is a straightforward 45 min – 1 hour hike over a low mountain pass. Bunes beach requires a ferry trip from Reine, followed by a relatively easy 1 hour hike. While Horseid beach, the most difficult to reach requires the ferry and an additional hike of several hours, or an even longer hike over steep mountain passes from Selfjorden. This isolation is partly what makes these beaches so special, no power lines, no noise from cars, no city lights in the distance, just the wild, rugged Lofoten landscape. The three beaches are all unique in some way, all having something to offer which the others don’t. It’s difficult to say if one is better than the others, meaning you need to try and go to all of them and decide for yourself. The sheer size of Bunes beach is amazing, and you don’t realize just how big it is until you start walking across the sand and count the minutes passing by on your watch. The stunning views down to Kvalvika beach, with mountains rising up all around is perhaps one of the best views of Lofoten. While the quiet Isolation and sublime beauty of Horseid beach will leave you knowing you’ve found paradise. 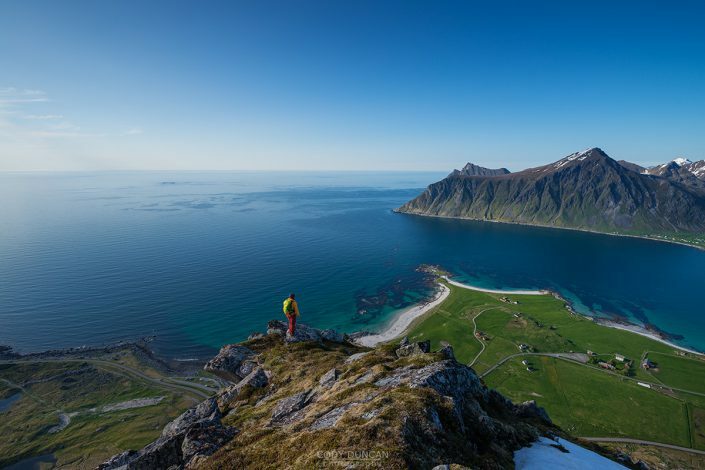 Bunes, Kvalvika, and Horseid are Lofoten, and indeed, all of Norway at its best. Kvalvika is the most popular though smallest of the three beaches and reached after a fairly easy 45 minute – 1 hour hike. At high tide the beach is separated into two parts, the larger right side and a smaller beach on the left, beyond the rocks. 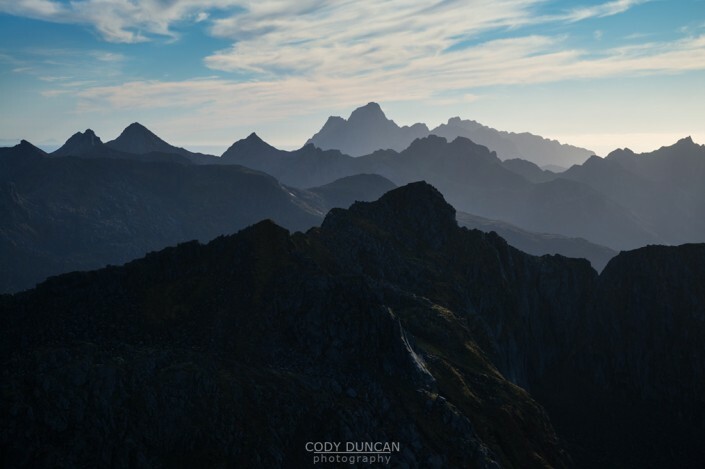 Set deep in a broad bay, a ring of high mountains surround Kvalvika. 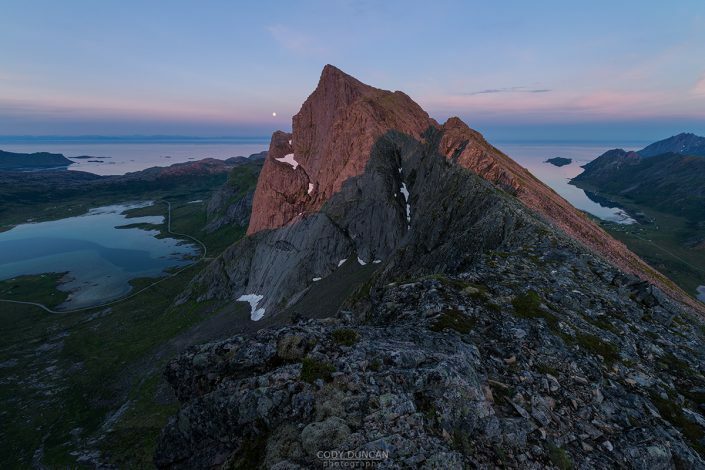 The best views of Kvalvika are not from the beach itself, but rather from the slopes of Ryten, the 500 meter high mountain that towers over the right side of the beach. Kvalvika also makes a wonderful location for a night or two of camping, with plenty of places to pitch a tent on the flat grassy dunes at the back of the beach. 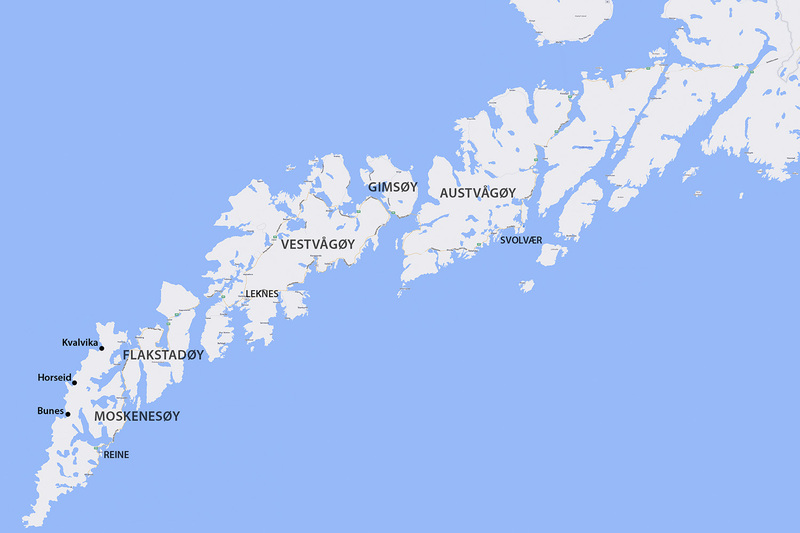 From any location on Lofoten, take the E10 to Fredvang. After leaving the E10 and crossing the twin bridges, turn left into Fredvang and continue along the road through the village. After approximately 3 km (from the turn) you will see a red boat shed on the left near the water. Immediately past this is a paved parking turnout large enough for 7-8 cars. Park here. Directly across from the parking area you will see a trail heading into the bushes and up the hill. There are several entrance points, but they all merge together at some point. The beginning of the trail is moderately boggy as it heads through the mountain birch and up the hill. After 10-15 minutes you will be mostly clear of the trees and head towards the center of the pass. Elevation gain is gentle here as the path takes you between the two mountains. After about 30-40 minutes you will reach the top of the pass and begin the decent to the beach. Here the trail gets steep and rocky in places, and quite slippery if wet. Continue down towards the beach if you can see, or towards the sound of waves if you’re in the clouds. About 1 hour after leaving the car park you should be arriving at the flat, grassy dunes at the back of the beach. CLICK HERE – for a more detailed hiking guide to Kvalvika beach. 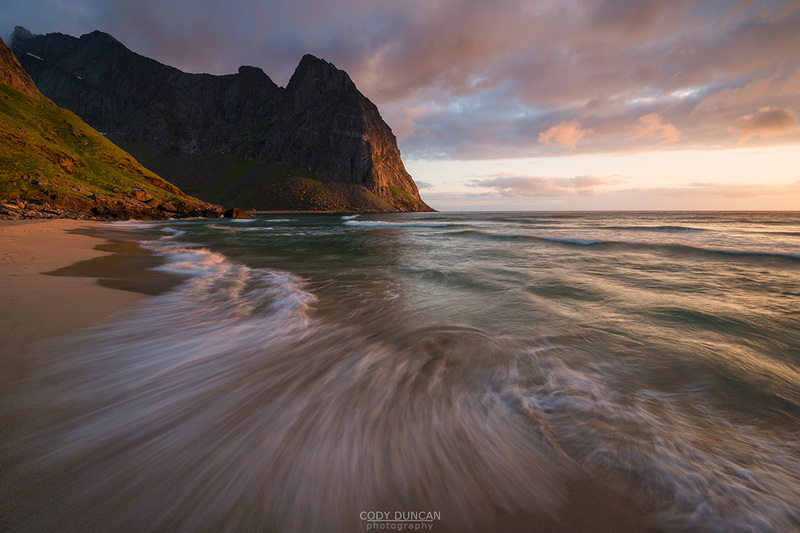 Bunes is one of the most scenic and isolated beaches on the Lofoten Islands. Though unfortunately this isolation does not always mean the beach is uncrowded. On a sunny summer day thick crowds of tourists will be waiting on the pier in Reine to catch the morning ferry over for the day. However, as afternoon approaches the crowds begin the walk back over the pass on their return to civilization. Now the beach becomes empty and quiet, likely only a few groups of campers will remain and have the place to themselves. If you are there in summer, time is irrelevant anyhow; the sun will shine until late in the night when it finally passes behind the mountains to the north. The beach is larger than it first appears. From the end of the trail to the water is around 600-650 meters, while the beach is 750 meters across. High, glacially carved cliffs surround the beach, the massive 602 meter west face of Helvetestinden being the most impressive. The beach faces north-west and is a good place to catch a sunset from late summer to early autumn. Wander out to the cliffs on the left, past the single house, for the best views. Storms can unfortunately leave sections of the beach rather covered in debris, particularly towards the back. Though on the bright side, a ready supply of driftwood can be found for evening campfires. Take the ferry from Reine to the village of Vindstad. After exiting at the pier, follow the path towards the right through the village and towards the back of the Fjord. After about 2 km the village will end and there will be a small trail on the left. This should be marked with a sign saying ‘Bunes,’ or something thereabouts. An easy and well worn trail leads over the small pass and down onto the beach. Be sure to measure how long you’ll need to get back to catch the ferry on time, but 1 hr should be plenty for most people. Horseid is a long and narrow beach wedged between high mountain walls. From when your feet first touch sand until you finally reach the sea is a 20+ minute walk through grass covered dunes and golden sand. The crystal blue water on a calm summer day is all too inviting for a swim, if only it wasn’t 170 km north of the Arctic Circle! The 2+ hour hike required to reach Horseid means it is the least visited of the three. And combined with the ferry schedule, a day hike is near impossible on most days. If you are venturing to Horseid, I highly recommend you combine it with a night or two camping. The best camping is found at the front of the beach on the right side, up on the little hill. There are several spots here that are more sheltered from the wind than others. Otherwise, if the weather is really bad, there are some sheltered spots hidden among the dunes about midway down the beach on the right side. From Reine, take the same ferry as to Bunes, but you will exit at Kierkefjord/Kjerkfjord (pronounced roughly Sher-kuh-fjord). At the end of the pier walk towards the right. After some 100 meters through the village you will pass a small stream and (hopefully) see a sign pointing towards a small trail on the left. The trail is somewhat overgrown and grassy, but it heads towards the pass between the two mountains. If the clouds are low, just keep going up, there is only one way. At the top, the trail flattens temporarily before descending a rather rocky, steep, and muddy hill towards the beach. Once down from the pass you’ll walk by a small lake and be surrounded by stunning walls of granite. The trail here is boggy at times, but easy to follow. Keep going towards the beach. Once you reach the sand at the back of the beach it will be about 20 minutes until you’re at the water. Total distance: about 3.5 km to the back of the beach, 4.5 km until you reach the sea. CLICK HERE – for a more detailed hiking guide to Horseid beach.